I really, really like sunglasses. I mean, I haven't yet gotten to the point where I wear sunglasses in the heart of winter, at a time when a shining sun is just a distant memory, but I must say, I'm pretty close. So close. Give me one more winter and I'll start wearing sunglasses in 3 degrees. Celsius and/or fahrenheit. I used to have a mammoth sunglasses collection. 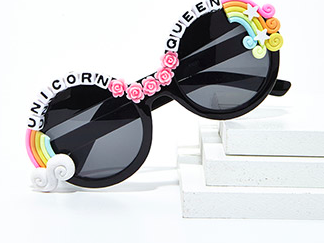 Every time I went shopping, a pair of sunglasses inevitably found its way into my cart. My collection consisted of really cheap sunglasses - I'm talking $10 or less - but still, it was getting out of hand. Eventually, I gave away ALL of my sunglasses and invested in 3 designer pairs that I really loved. And I've worn those 3 pairs happily for the past few years. But then something dangerous happened. I compiled the collection of sunglasses for this post. And it triggered my sunglasses addiction. And now I'm itching for some new pairs. I'll even forgo Prada or Miu Miu sunglasses for now. All I'm asking for is 456 pairs of Urban Outfitters and Forever 21 sunglasses. A pair (or seven) of Ray-Bans wouldn't hurt either. But I'll stay strong. Maybe I'll just allow myself one affordable pair. K, two. The sunglasses above range from $5-$500. Decide if you want to invest in a designer pair or if you just want to buy a couple of cheapies. I'm not an expert in face shapes, so I won't be of much service in helping you decide which shape to go for, but there are many websites that will help you figure out the right frame for your face. You can try here or here for helpful guides. Once you figure out which is the right frame for your face, go back to the six styles above to see if there are any pairs that you love. Happy shopping!